Thanks to Gill for the heads up. “Line of Fire” – It’s Christmas Day and President Kirkman is alerted to a group of religious extremists who refuse to evacuate when a forest fire threatens to engulf their cabin. Deploying Emily and Aaron to help diffuse the situation, Kirkman must act quickly to save multiple lives at stake. 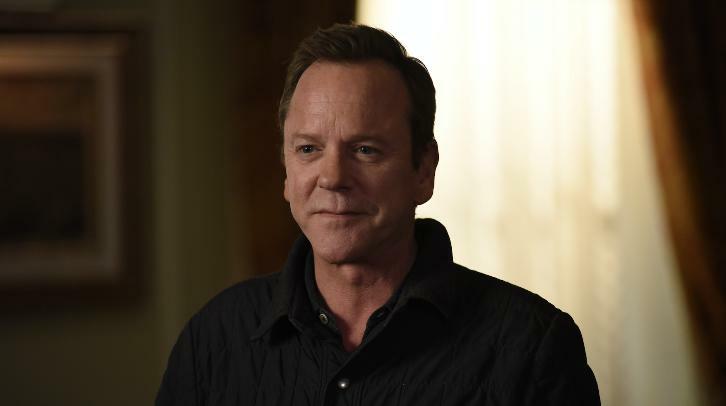 Meanwhile, the First Lady finally gives her testimony to the FBI director, while what happens next changes the lives of the Kirkman family forever, on the midseason finale of ABC’s “Designated Survivor,” airing WEDNESDAY, DEC. 13 (10:00-11:00 p.m. EST), streaming and on demand. “Designated Survivor” stars Kiefer Sutherland as Tom Kirkman, Natascha McElhone as Alex Kirkman, Paulo Costanzo as Lyor Boone, Adan Canto as Aaron Shore, Italia Ricci as Emily Rhodes, LaMonica Garrett as Mike Ritter, Zoe McLellan as Kendra Daynes, Ben Lawson as Damian Rennett Kal Penn as Seth Wright and Maggie Q as Hannah Wells. “Line of Fire” was written by Keith Eisner and directed by Chris Grismer.